You know what really improves the taste of almond (or any) milk? Donuts. “Mylk”—for those not in-the-know—is any non-dairy milk (almond, cashew, hemp, etc. ), and it has become increasingly popular with coffee drinkers as a substitute for dairy creamers. Locally-made nut milks could previously only be found on the North Fork at Southold’s The Giving Room, or from your own kitchen. But South Fork lovers of house-made “mylk” can now rejoice— Grindstone Coffee & Donuts on Main Street in Sag Harbor makes and sells their own handmade, small batch almond milk. 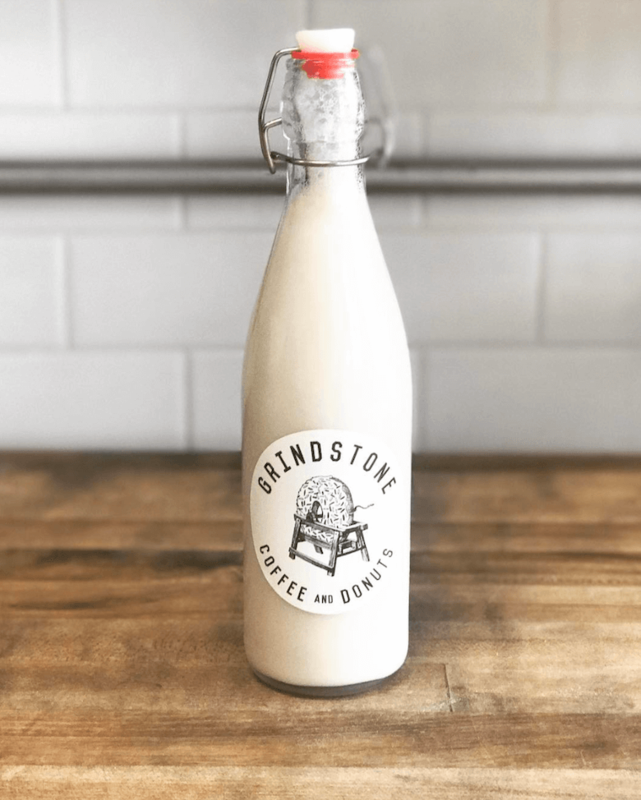 With more and more customers ordering almond milk lattes, Grindstone’s owner Kyle Shanahan decided that, just as his doughnuts are handmade with wholesome ingredients, so should his almond milk. Grindstone is famous for their 48-hour-proof brioche-style doughnuts made with non-bromated flour, local milk and eggs, in unique flavors like Lemon-Poppyseed and Chai. Grindstone’s almond milk is hand-blended, made from just raw almonds and filtered water. A large pitcher is kept behind the counter for making creamy lattes or teas, and the rest is sold in great looking old-fashioned glass stopper bottles in the open fridge. At $14.50 per bottle, this almond milk is not cheap—but an average bottle can yield 2 bowls of cereal, a small smoothie, and a latte (at least, that’s how mine gets used). The small batch “mylk” keeps for up to four days in the fridge, and the taste is outstandingly creamy and delicious, and not a bit like boxed almond milk from the grocery store. Tip: dunk a Grindstone Nutella-S’more doughnut in a cup of cold almond milk, take a bite, and feel your happiness quotient rise.